The Bianchi 75 Venom Holster is a premium full-grain leather belt slide design that is built for discreet carry. Its low profile and deep molded shape minimize visibility and give it a secure custom fit, while the open muzzle accommodates different barrel lengths. At the top, a thumb break improves security without slowing down your draw. Its single belt slot provides a reliable attachment to a belt up to 1.75 inches, and gives the holster a high ride position, keeping it tucked in close to the body for concealment. 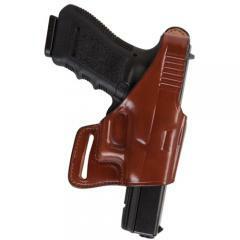 The holster also has an FBI-style 15 degree forward cant for easier access while standing or seated.